LeSean McCoy: Can He Overcome a Potentially Anemic Offense? With the NFL Draft and free agency having come and gone, we’ll break down all sorts of fantasy-relevant questions entering the 2018 season. Up next is a look at whether one of the shiftiest running backs to ever play the game will thrive at age 30 with an underwhelming supporting cast. By the time September rolls around, LeSean McCoy will join LeGarrette Blount and Marshawn Lynch as the only active starting running backs over the age of 30 . Unlike the latter two, Shady will have a three-down workhorse role. One problem: He’ll have to deal with a three-way quarterback competition on a rebuilding team that outperformed its Pythagorean win total by 2.6 wins last season. The Bengals spent four years with A.J. McCarron and still decided they were better off with Andy Dalton. McCarron has thrown 14 passes since 2015. Nathan Peterman ranked among the bottom-three signal callers out of 56 quarterbacks that started at least one game last season in completion rate, interception rate, and adjusted yards per attempt. FantasyLabs editor-in-chief Matthew Freedman called Josh Allen “Jake Locker with the arm of Kyle Boller and the uniform of J.P. Losman. The rest of the offense isn’t any prettier. Kelvin Benjamin makes Dez Bryant look like the league’s premier separation artist. Potential bust Zay Jones and slot journeyman Jeremy Kerley don’t exactly move the needle. The Bills ranked 27th in adjusted line yards, per Football Outsiders, and have since lost center Eric Wood to retirement and traded left tackle Cordy Glenn to the Bengals. In fact, the Bills are presently one of just 10 teams with a win total of 6.5 or lower (BetOnline). Per our NFL Trends tool, running backs on average have scored fewer DraftKings and FanDuel points per game with reduced value and Consistency as underdogs since 2014. It’s going to take a herculean effort from McCoy to drag the Bills into the playoff picture. Shady has gotten to work with two of the better rushing quarterbacks in recent memory in Taylor and Michael Vick, and while the likes of Donovan McNabb and Nick Foles weren’t exactly statues, they also weren’t regularly threatening defenses with read-option looks. McCoy has consistently been less efficient without a true rushing threat under center throughout his career. Josh Allen is the most athletic quarterback on the Bills roster and rushed for 767 yards in his collegiate career, but he still isn’t the type of dynamic dual-threat quarterback that can truly stress a defense horizontally. The Bills’ lack of a proven passer combined with roughly zero vertical threats will likely result in a heavy diet of loaded boxes for McCoy to deal with. The best version of Shady would probably still be able to overcome an extra defender in the box, but that player wasn’t around much in 2017. McCoy has started at least 12 games in eight consecutive seasons. While he should be commended for playing 16 games in 2017, he struggled to provide his usual efficient production. Shady posted eight-year lows in yards per carry (4.0) and first-down rate (19.5%), while his average of 71.1 rushing yards per game was his second-lowest mark during that span. However, McCoy’s 2017 success is a bit misleading considering he posted three-year lows in Plus/Minus and Consistency Rating on both DraftKings and FanDuel, and now he’s poised to join Matt Forte and Adrian Peterson as the only running backs over the age of 29 to handle a workhorse role since 2014. Still, Shady is currently being drafted below his floor. It’s rare for an older running back to secure a three-down role these days, but age alone shouldn’t remove him from RB1 consideration. 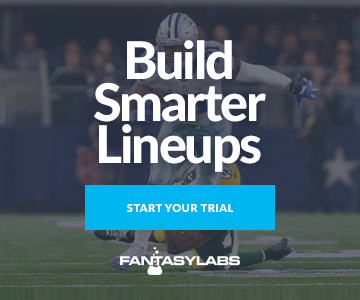 His agile style might not help him age gracefully, but his projected massive workload makes him an attractive second-tier RB1 option for season-long leagues as well as a potential low-owned target in DFS. McCoy has been accused of domestic violence and could face a six-game suspension as a first-time violator of the league’s domestic violence depending on the outcome of the investigation. If McCoy is ultimately suspended, the Bills would likely move forward with a committee backfield featuring Chris Ivory and Travaris Cadet. Considering Cadet had more receptions than rush attempts while splitting time with the Jets and Bills last year, Ivory would likely slide in as the team’s early-down and goal line back. Ivory might theoretically age less gracefully than Shady given his physical running style, but he has provided ample fantasy production with a featured role since entering the league in 2010. Watching Ivory attempt to pound his way through loaded boxes 15-plus times a game likely won’t be pretty to watch, and the Bills offensive outlook would be even bleaker if Shady is forced to miss six games. Still, not many backs around the league can attest to this sort of weekly usage. The league’s fourth-most run-happy offense from 2017 figures to again attempt to make a living on the ground. None of the Bills (including McCoy) are shaping up to be league-winning fantasy assets, although there might be enough volume for their featured back to retain fantasy relevance in the right matchup.